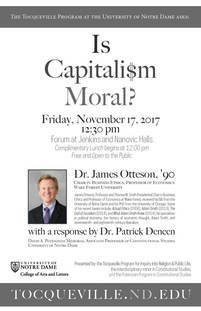 Notre Dame’s Tocqueville Program welcomes back to campus ND alumnus James Otteson ’90, who will address the question, “Is Capitalism Moral?” in an on-campus lecture on November 17, 2017, at 12:30pm in the Jenkins and Nanovic Halls Forum. Professor Otteson is Professor of Economics and the Thomas W. Smith Presidential Chair of Business Ethics at Wake Forest University. A 1990 graduate of the University of Notre Dame (Program of Liberal Studies), Prof. Otteson is the author and editor of several books, including Adam Smith’s Marketplace of Life (Cambridge, 2002), Actual Ethics (Cambridge, 2006), and The End of Socialism (Cambridge, 2014). Dr. Patrick Deneen, Notre Dame’s Potenziani Associate Professor of Constitutional Studies, will offer a response to Prof. Otteson’s lecture. The lecture, which is free and open to the public, is co-sponsored by the Program of Constitutional Studies. A complementary lunch will be served at noon.